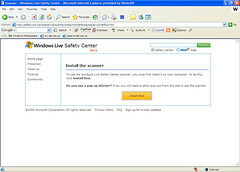 Microsoft came out today with a brand new beta product named Windows Live Safety Center. 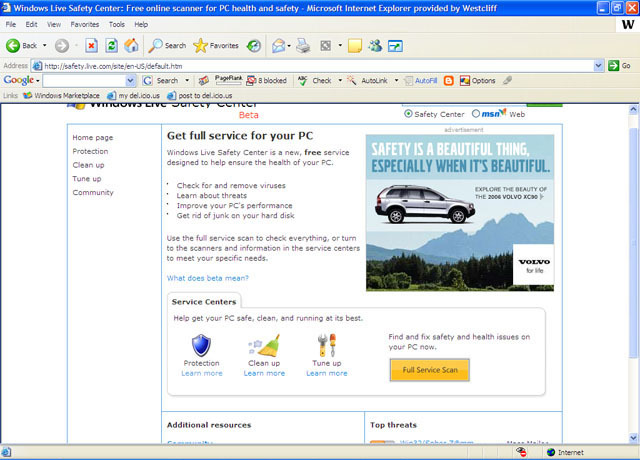 The application can be installed and executed online, which could cause some problems with the removal of certain viruses. 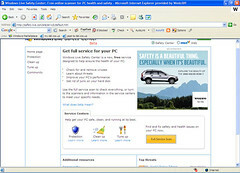 Windows Live Safety Center is a new, free service designed to help ensure the health of your PC. Basically, they just released a Norton systemworks lookalike. This is nothing new, but it is free! I think most IT people will prefer to keep their original tools to do their work. This application was meant to be used by people who do not know much about computers and who wants to keep maintenance of their operating system as simple as possible. 2. Install the scanner: Press the yellow "Install scanner" Button. 3. Select Complete scan, and press Next. This will start the scanning process. It will first download the updated version / definition of each tools, and after, do a complete scan of your computer. 4. You now have the results. 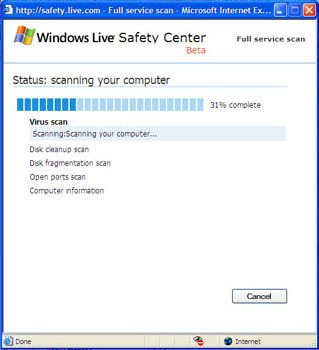 Yes I know, I had 3 viruses on there. But they are actually supposed to be there. My job requires me to do some security audits on my network, and the tools I use fall under a virus-like category. Don't worry, I'll be just fine. 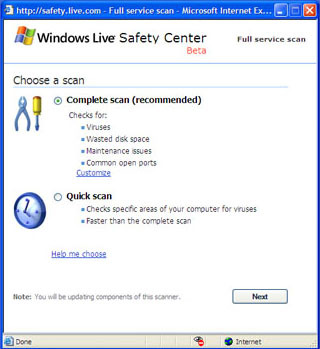 The viruses will be removed automatically, but for the other categories, you always have the choice to do something about the discovered problems by selecting the appropriate checkbox. When you are finished, press NEXT. Your temporary files will then be deleted, and your hard disk defragmented if you decided to do so. I do recommend this tool to people who do not have the time to tweak their computers. The application is still in BETA phase, but it is very functional. I do not think this could replace a fully functional, real-time protection anti-virus, at least not until they release a version that loads up and memory and protect your system at all time. Well, that's all there is to say right now. I'll keep you guys updated about the product when new features comes out. If this article interested you and you are an IT person working in a corporate environment, I would suggest you to consult my other article about the art of patch management. Patching your computers against vulnerabilities is as important as protecting them against viruses, especially if you have to do it on a large scale where you cannot afford to do this manually. Update: Ok, this is more a walkthrough then a review. I did post my opinion about the product. I wanted to show people what the product looked like, and how it worked. If people didn't like the walkthrough, they wouldnt have digged it. Thanks to everyone. 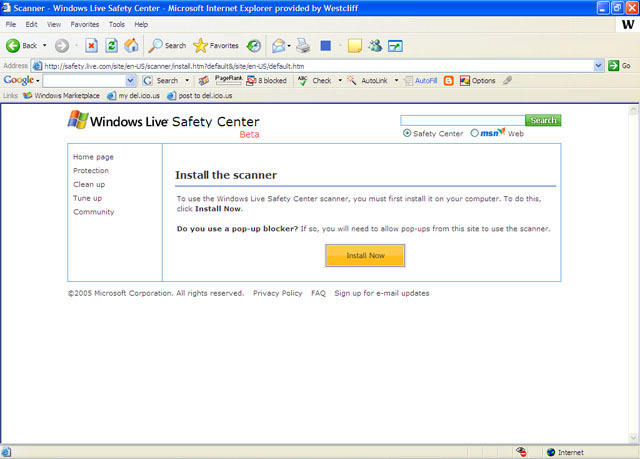 "Firefox users should use the IE Tab extesion to use the scanner. It'll open the link in a new Firefox tab using, but using IE. Here's the link. https://addons.mozilla.org/extensions/moreinfo.php?id=1419&application=firefox"
great review. I wanted to check this out. Keep us posted on any new observations. Is this a new product or have they purchased another company's av engine? personally, I would not use a microsoft anti-virus. i would be afraid of it full of security holes like all other microsoft software. M$ bought GeCAD, Sybari and Giant software in the last couple years. And it was Rumanian not Russian and the first thing MS did was to kill it's free Linux mailscanner for servers!!! It doesn't work with Firefox so i can't use it. If you hit ALT-PrintScrn, it'll only copy the current window to the clipboard. Therefore no cropping.
" I do not think this could replace a fully functional, real-time protection anti-virus, at least not until they release a version that loads up and memory and protect your system at all time." 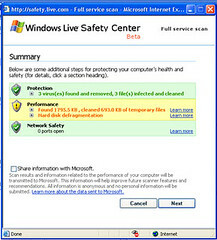 That would be Windows OneCare Live, the big brother to the Saftey Center version. I've been running the beta for three months now on all of my XP machines, and I'm quite impressed indeed. Thanks for the review, the price is definitely right. 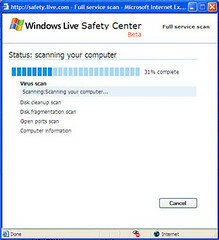 I've been using Microsoft's antispyware tool for a while and I like its kept my PC very clean. I appreciate that Microsoft is finally taking security a little more seriously. Its funny how heavily they are promoting their live.com initiative. I was channel surfing last nite and noticed they were selling a live.com product on the apprentice. Microsoft isn't taking security more seriously by handing out "free" software to cover their arses. It's PR - and I don't think it wise to secure Microsoft with Microsoft, as the big red dot is fixed on M$. For effective "security", use other software packages, such as WinClam or SpywareGuard or Spybot, and so on to secure your PC. I use them far more than the MS equivalents, as I don't want to sweat the probability of those being exploited. Not impressed ! Did a scan - let it do it's thing - clicked remove , finish . Wiped out about 5 years of genealogy files . No problem , just did a Restore - problem resolved . B-U-T ; this is supposed to be for people who are computer illiterate ! When a user friendly program that messes with the registry is thrown out to the casual home user (I know its Beta - but ? ) ; there could & will be head banging problems .